The potato is one of the cheapest vegetables in the supermarket, and they can go a long way in feeding a lot of people. The problem is that potatoes can become just another boring side dish when they don’t have to be. When cooking potatoes, you generally think of just baked or mashed. Baked potatoes are easy, but they take a while to cook. In addition, the traditional toppings grow old pretty fast. And mashed potatoes require a little bit of extra work. Plus if you’re like me, mashed potatoes need to go with something that has gravy. Potatoes don’t have to be boring. I have a great recipe for potatoes during the summer that is a refreshing change to the old standbys. The real key to this recipe is the simple sour cream dip that works for many other applications as well, but it goes perfectly with these potatoes. And the best part is, it all costs just a couple dollars and can feed people for a few weeks. 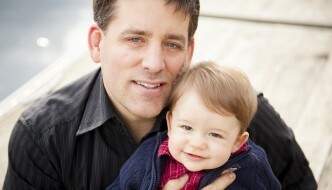 You can click on the images below for enlarged pictures. The ingredient list is pretty simple. 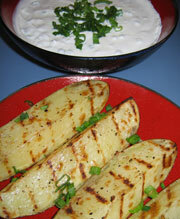 You’ll want a few long and slender russet potatoes, some green onions, sour cream, olive oil, and some salt and pepper. That’s it! 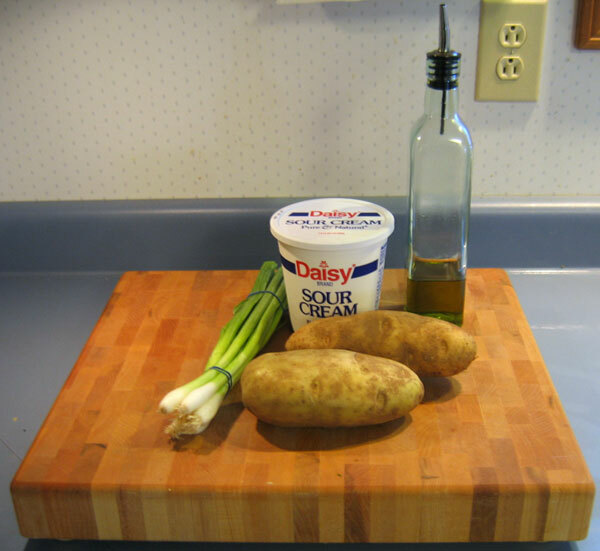 If you’re doing the math at home, the cost breakdown for me was: $1.99 for the sour cream, $0.99 for the green onions, and $0.79/lb for the potatoes. These two weighed in at about a pound and a half for a total of $1.18. So the grand total came to $4.16. Of course, only half of the sour cream is being used for this dish, so the actual cost is around $3. Most of the cost is in the dip, but that’s good since the dip lasts a few weeks in the fridge and can be used for a number of different applications. You couldn’t ask for an easier dip. If you have a 16 oz. 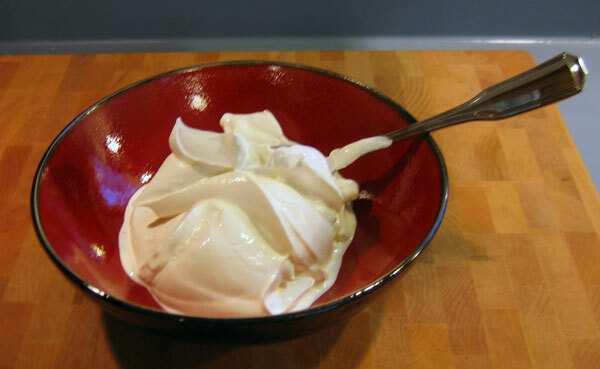 tub of sour cream like I do, dump about half of it into a bowl. Or if you have an 8 oz. tub, the whole thing would be fine. Of course, there is no problem in using all 16 oz. either since this dip will keep in the refrigerator as long as the sour cream would. Then, go ahead and chop your green onions. I chop them somewhat fine as they seem to lend more flavor to the sour cream that way. Once chopped, go ahead and add about 3/4 of them to the sour cream and save some for a topping and a garnish. Then, add some fresh ground pepper and some good coarse salt. I do about 20 turns with my pepper grinder, and a few good pinches of kosher salt. When you’ve mixed it up real good, take a taste and see if it needs any additional salt or pepper. What you’re looking for is the salt and pepper to take some of the tang out of the sour cream. There are no exact measurements, but keep tasting it until you’ve found what works best for you. To finish off the dip, go ahead and put some of the green onions that you set aside and sprinkle on top. And that’s it. 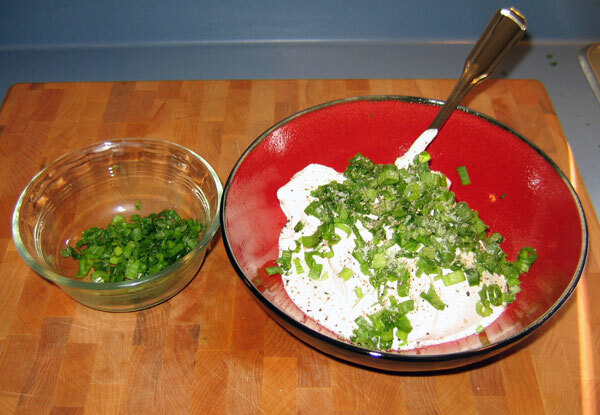 If you have time, I like to let it sit in the refrigerator for a few hours before using so that the green onion flavor can really get into the sour cream. Cooking the potatoes is about as easy as making the dip. 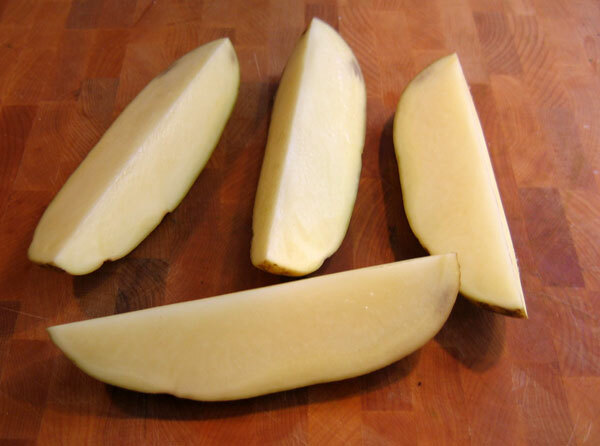 You’ll want to simply cut the potatoes in half lengthwise and then cut in half again to quarter them. This is why you want to have long and slender potatoes rather than round. Once you have them quartered, just put them in a pot of cold water and bring to a boil. Once reaching a boil, I set my timer for 15 minutes. Usually 15 minutes isn’t long enough to fully cook the potatoes, but that’s good. Once 15 minutes has elapsed, I then check for the desired firmness every minute or two with a fork. The key here is to make sure they are done enough, but not overdone. If they aren’t fully cooked, they are hard, but since these are going on the grill, if they are overdone, they can be too soft and fall apart on you. 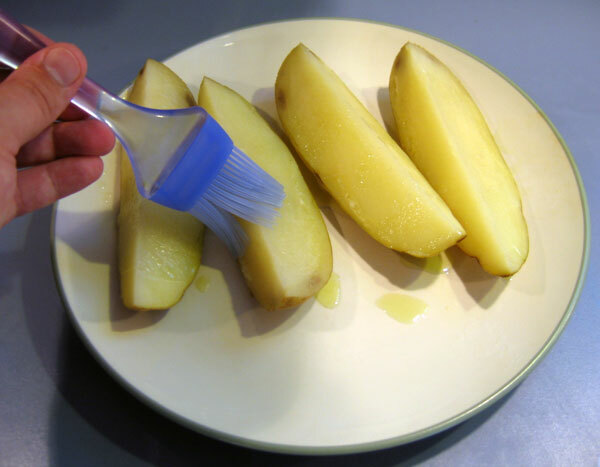 So, just carefully poke them with a fork so that it goes in easily without breaking apart the potato and you should be perfect. 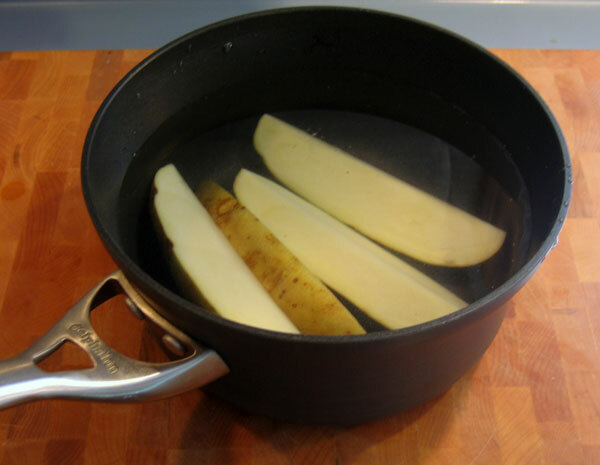 Once the potatoes are cooked through, drain the water and place them on a plate or platter. You’ll want to go ahead and brush on some olive oil. Make sure you get all sides, including the skins. Seasoning the potatoes involves nothing more than adding some salt and pepper. Again, make sure you season all sides, and it is good to be liberal with the seasoning since some of it is bound to fall off on the grill. Once you have the potatoes seasoned, it’s off to the grill. 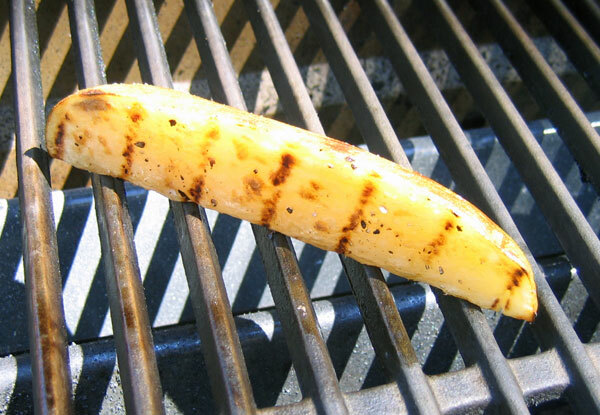 Make sure you get the grill nice and hot, and you’ll be looking for a nice high and direct heat for this. I place mine down skin side first, close the lid, and give them about 2 minutes. Then I go ahead and flip them to one side and leave for another minute or two, and repeat on the last side. Total cooking time is about 5-6 minutes. You’re looking for good sear marks and a slightly crispy exterior as seen below. And there you have it. You have a great sour cream dip that is not only great with these potatoes, but can be used to top your baked potato, or even serve as a great chip or vegetable dip. And if your kids don’t like the sour cream dip, you can just tell them it is a giant french fry and let them dip the potato in ketchup. What I really like about this side dish is that it is great for entertaining. You can make the dip well in advance, and you can boil the potatoes in advance as well since you only have to finish them for about 5 minutes on the grill. This can save a lot of time when trying to prepare the rest of your food. 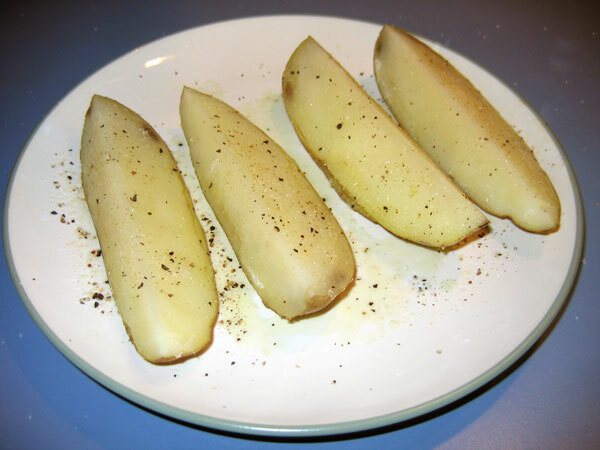 As far as portion sizes, I find that one medium-large potato is plenty for 2 adults, and if you have a lot of other food to go around, one potato can easily serve four. Wow, that looks absolutely delicious! Great post, you did such a nice job presenting the pictures too...I am definitely going to have to try that recipe this weekend! You have to mortgage your House to buy potatoes? You obviously don't live in Florida where potatoes are outrageouly priced! A stupid little 5lb bag of the cheapest spuds are $6.50!! If you want Idaho bakers, get a 2nd Mortgage! froogrl, that is great to hear! It can be challenging to strike a balance in firmness, but once you get the hang of it, it's pretty easy. I'm glad everyone liked them, and it's nice to know someone put this to use. We threw a barbecue over the weekend, and we made this recipe. 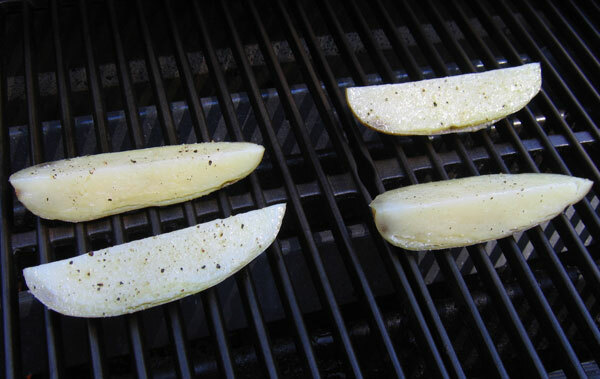 With the exception of the few wedges that fell apart (you really don't want to over-boil them) and the three wedges that landed on the deck en route to the grill, every single piece from the 5# bag was eaten. Thank you for sharing this easy and delicious recipe. We'll definitely be making it again! Looks delicious, thanks for the great ideas. Wheeler, I agree that you can find much better prices. I pretty much did a worst-case scenario by shopping at a non-discount store with nothing on sale and name brands. Clearly you can find these items for much cheaper if you're a smart shopper. Thanks for sharing, it looks very yummy! I probably will substitute the sour cream for yogurt for a lighter taste.